In the back of my mind, I’ve always wondered what my little nephew and two nieces would think when they finally came to their conclusions and questioned my living arrangements with Madelene. They have no concept of what “homosexuality” is, they’re 4-6 years of age. I never led them to believe either or. I never display public affection anyway, so it’s clueless to many who come across Madelene and myself. We’re pretty reserved – not to be confused with in the closet. Even though Madelene and I got married in MA, I didn’t want any of my little ones there, only because it would have confused them a great deal, as the photo already posed deep thoughts to little Sophia. I’m not saying that teaching kids about homosexuality is bad, but at that young age they are very impressionable and shouldn’t be taught anything until the age of 12 or higher – above puberty, at least. That’s just my opinion on that. I make sure that Madelene and myself refrain from any ‘relationship talk’ or ‘marriage blabber’ in front of the little ones. They don’t need to know, in my personal opinion and I’m content with that. When I was still living in the apartment above from my parents’ house, little Sophia a bit over the age of 1 would sit on my bed and we would play “the picture game”. I would give her a picture and she would say, “Mama” or “Nana”, or whoever was on the photo. It gave her a sense of recognition and she could sit there for hours going through all the photos. One morning she came upstairs and walked into our bedroom. She pointed at one side of the bed and said, “That’s where 'Magic' sleeps." (She used to call Madelene, “Magic”.) Cute, right? Anyway, the point is: she never once saw Madelene upstairs in the bedroom or saw us sleep, so how did she know which side she slept on? It had us laughing and wondering how she knew at the same time. Do kids just sense things? I think it’s so important to have kids figure out on their own if they’re gay or straight. They’re going to know about homosexuality whether you teach them or not. I never knew anyone who was gay while growing up, yet I knew I was different; I knew I was gay. I didn’t say anything only because I wasn’t surrounded by people who were like me. Now times are different and people are more comfortable with their sexual orientation. It's more accepted. I don’t think we need a diagram to explain their sexual orientation. Let them figure it out on their own while being taught about reproduction and how our organs work in the way that pleasures us at the appropriate age. Quick lowdown: Sophia is a little me. Not only does she resemble me when I was her age, but she wears boys’ clothes and wants to be identified as a “boy”. She goes by “Sam” and prefers anything boy-related. Does this mean she’s going to be gay in the future? Maybe – maybe not. Does it mean she will one day want to be a boy and change her identity? Possibly, or possibly not. You don’t know until after puberty and choices shouldn’t be made before then in my opinion. I just hope that she loves herself the way she is and is always comfortable knowing that whatever choices she does make, we’ll be behind her 100%. I’m hoping that one day if she does decide anything, she’ll come to me for support when she needs it. 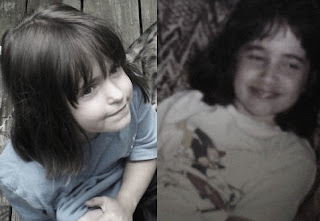 Here’s a photo of Sophia on the left, and me on the right at her age. She’s a “mini me”.